Kindergarten is a tough time for some kids. It's the first time that they are away from their mother or father for an extended period of time. To help ease the experience, Japanese kindergartens and pre-schools have cute, colorful buses. The buses are supposed to hopefully make children want to ride them — and thus, go to school. 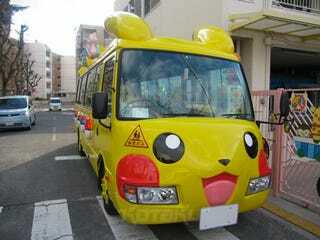 This Pikachu bus from an Osaka kindergarten does more than make kids want to ride it. No doubt some adults probably want to hitch one, too!